After I got the hang of the olive oil, lemon juice, yoghurt & mustard dressing, I started experimenting with something different. 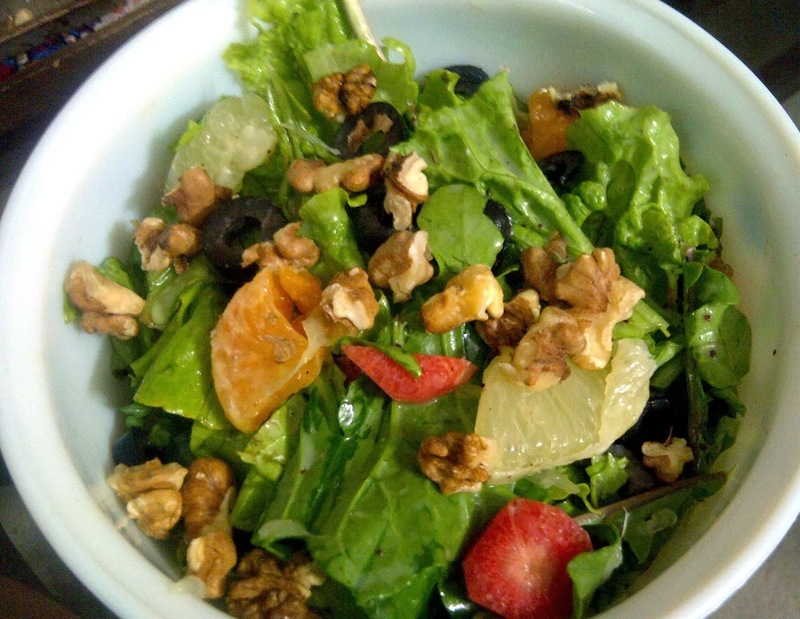 This time I made a salad with fruits & nuts with a honey based dressing - loved the slightly sweet dressing with the grapefruit & olives. The carrot is only there because I had one lying around so I just tossed it in the salad, but wouldn't recommend adding it otherwise. 1. Blend the ingredients for the salad dressing in a blender for 30 seconds till it is creamy. Alternatively you can add all the ingredients and whisk for about a minute. Taste & adjust seasonings if required. 2. Dry roast nuts in a skillet for about 3-5 minutes over medium heat till they are aromatic. Keep shaking the pan so they don't burn. Alternatively, you can toast them in a toaster oven. 3. Take a big salad bowl and add lettuce leaves, baby spinach & rocket/arugula. You can increase/decrease the quantity of the specific type of salad green based on personal preference. 5. Chop & crush the nuts then add as garnish on top of the salad.